B11 5.45 g/l 3.71 Smoky, big astringency no green pepper could use some acid. B12 5.7 g/l 3.94 Nice claret color, very dark, nose hot sugar, astringency low low tartness, somewhat bitter. I still like this wine best after WC5. It is novel. Don't touch. WC5 acidity was 5.38g/l. 3/22/06 WCCV6 all Rubissow Grapes. M.H. tasting; Green pepper taste, later O.K. nose, veggie. CV57 Green Pepper big green pepper in taste. On 5/19/05 Gary noticed having to top up barrel B11 with 3 bottles instead on 1 bottle like the other barrels. A little inspection revealed the leak shown below. 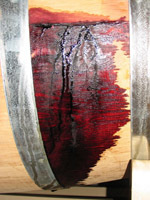 Subsequently we got some barrel wax from the barrel manufacturer Quintessance and were able to seal up the leak. They offered to repair the barrel but, that would have meant draining the two barrels on the rack above it to get it out of the basement. On 12/5 the wine was racked to the barrels through the Palo Alto wine utility. 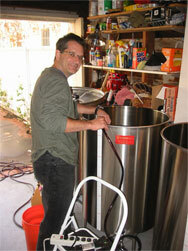 Mike can be seen at right pumping the fresh wine out of the tank over to Gary's basement. WCCV6 WC Am. Oak 2yr. Quintessance 60 gal. Wine 34 gal. from tank B + 26 gal. tank A All Rubissow Grapes. B11 WC/Cam 50.9gal/9.1gal Fr. Oak, New Quintessance leaker 60 gal. from Tank C 13 gal. Camalie old vines, Tank C 34 gal. Rubbisow,Tank B 12 gal. Old Vines. 76% Rubissow, 24% Camalie Old Vines. B12 Cam Fr. Oak Recoop New 15 gal. 86% Camalie 2002 replant young vines super ripe + 14% Camalie Old vines. See Winemaker's Notebook for details. This includes a virtual redistribution of the topping wine which was disproportionately more from the WC than from Cam. This was corrected in the barrel B11 volume split. Barrel Mix tasting party was held on 12/4/04. The wines tasted and their scores and rank are shown below. Conclusions: If you want good wine you've got to make it yourself! Camalie Vineyards' old vines just aren't as good as the neighbors' when the wine is young. After some time they can be O.K. though as CV57 did take second. Don't buy aged wines sold back to K&L. These wines have been taste tested over many years by their previous owners to be not worth as much drunk as sold back at a discount. The Dunn Vineyards wine is a good example. We want to keep the Camalie and Wine Coop wine in separate barrels. There is a distinct quality difference already. WCCV6 60 gal. Quintessance French Oak, Med+ Toast, 2yr. CV57 60 gal. Quintessance American Oak, Med+ Toast, 2yr. CV1 26 gal. World Cooperage Needs long soak 1yr? CV2 26 gal. World Cooperage, 2yr. Total Capacity available is 195 gal. Assuming Racking yield of 90% there will be 225 gallons of wine after racking to go into 195 gal. of barrel capacity. This will leave 30 gallons of wine for topping or about 12 cases. This is actually enough wine to fill another half barrel but, then we would need to purchase wine for topping. An M.L. Chromatograph was generated on 12/2/04. This poor chromatograph got crumpled and splattered with wine before it was run. It was the last piece of paper I had that was wide enough to do all of the samples. Conclusions: Most of the wines from this year are almost through M.L. Tank F is an exception. The lid wine spilled in O3 still has some Malic acid in it as expected. If used for topping we run some risk of having M.L. take place in the bottles although I think we could use it for topping at least the Camalie wine until next summer when M.L. fermentation will happen again if any malic acid is left. The Malo Lactic fermentation was initiated on 10/13/04. M.L. 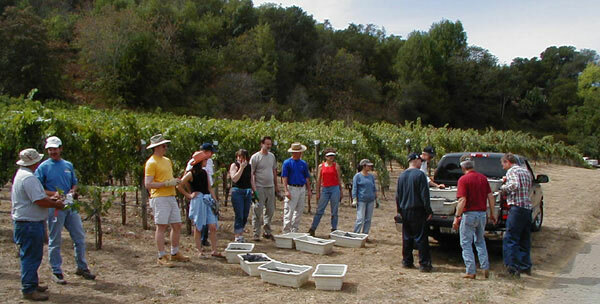 nutrients were added according to Wine Lab recommendations. M.L. cultures were sprinkled on the top. On 10/19 the wine was stirred gently to disperse the M.L. bacteria but, not stir up the lies. The total volume pressed was 251.7 gal. Which was made up of 142.4 gal. of Wine Coop wine and 109.3 gal. of Camalie Vineyards wine. These numbers are approximate as they are calculated by measuring the wine level in the tank and multiplying by a geometrically calculated volume per inch number. Our expectation for the Wine Coop wine is that it would yield 148 gallons based on last year's press yield but, because of more solids in the grapes and more dehydration we ended up with 4% less wine than expected at 142 gallons. 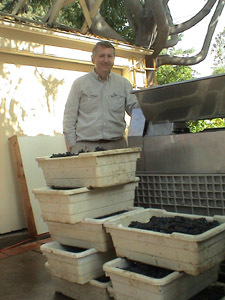 Press yield was 68% rather than 71% as it was last year. Post Press Source Volume Yield T.A. g/l pH Alc. By Vol. Spec. Grav. *Tank C contains a mix of 37.4 gal. Wine Coop wine and 13.7 gal. of Camalie Wine. Fermentation was complete by 10/10/2004 with all lots below 995 specific gravity. Fermentation went smoothly and produced no sulfides due to aggressive feeding of the yeast throughout the first half of the fermentation. Use of sulfur was minimized in the Camalie Vineyards also to reduce sulfide smells but, in spite of the Rubissow grapes having significant sulfur residues they still did not emit sulfides during fermentation. Learning: Feeding of the yeast during fermentation is the key to eliminating sulfides from the wine. Sulfur on the grapes does not appear to be a significant cause. Totals 357 gal. 3678 lbs. Note: Wine Coop wine was strictly from Rubissow Grapes. Learning: Measure Brix always at the same time you expect to pick the grapes, early in the morning.